When you think about the ultimate dessert, what’s the first flavor that pops into your mind? For me, it’s always citrus. Add a little lemon, lime or orange to my cake and I’m all over it. Top it off with a citrus glaze and it’s as good as it gets for this girl. In this case, it’s Orange as in Orange Blossoms. Helpful Hint: Before you make my Orange Blossoms, pop a piece of gum in your mouth. 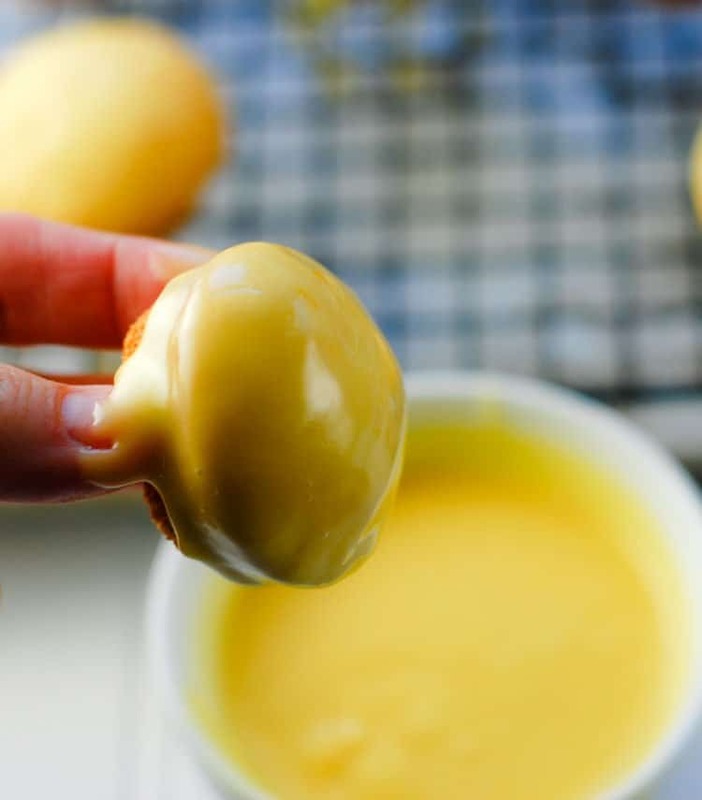 That way you won’t be tempted to scarf down the tiny little bit of batter that’s left over OR lick the glaze bowl. Don’t say I didn’t warn you. 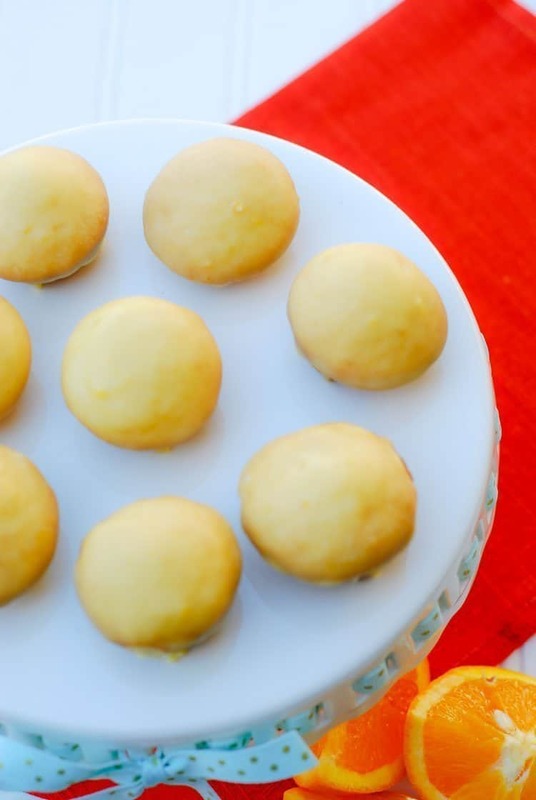 These delicious little cakes are perfect any time of the year and for any occasion – from showers to birthday parties – and everything in between. The recipe makes 48 mini cakes, so there’s plenty for you and plenty to share. And it’s probably one of the easiest recipes you’ll ever make because it begins with a cake mix. 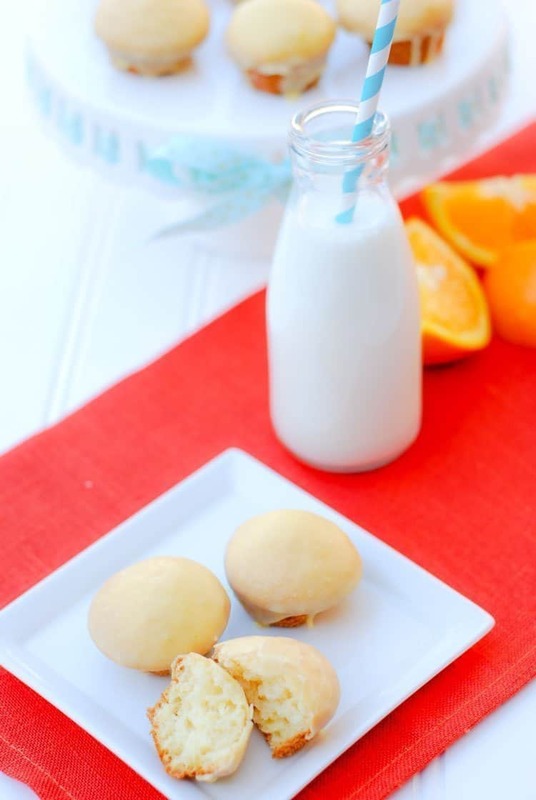 To make my Orange Blossoms, add 1 cup milk, 3 eggs, 1/2 cup softened butter, 1/2 tsp. orange (or vanilla if you don’t have orange) extract and 1 package of instant vanilla pudding mix. Mix together for two minutes and bake at 350º for 12 minutes. I make the orange juice infused glaze while the Orange Blossoms are baking so I can dip them as soon as they are not too hot to handle. I could jump mouth first into this glaze (keep chewing that gum)! Dip and cover as much of the mini cupcakes as you can. Let dry for about an hour and store in airtight containers. That’s it! These little orange blossoms are so good! 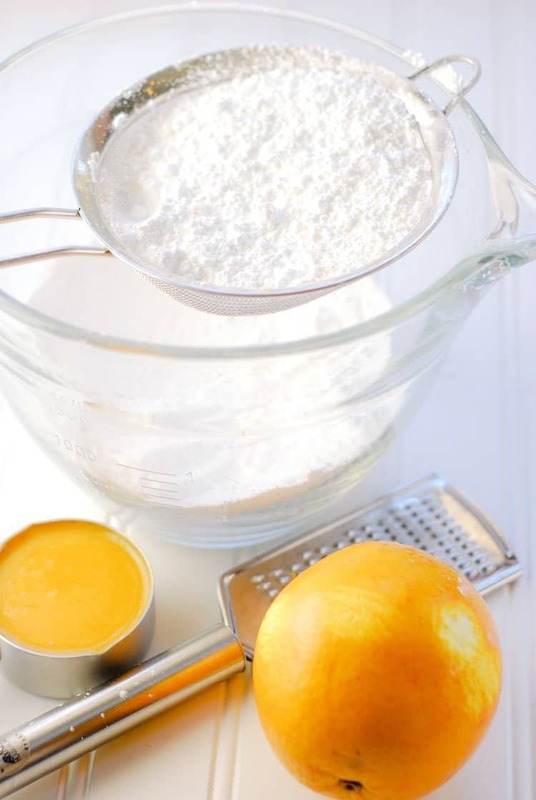 Combine first six ingredients in a mixing bowl and beat well with an electric mixer for two minutes. 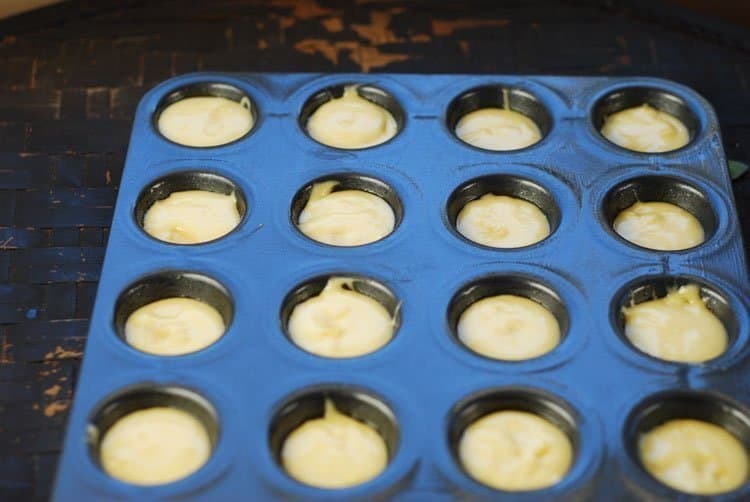 Spoon batter into mini muffin cups, filling each muffin tin halfway. Bake for 12 minutes. Turn out onto a kitchen towel. Sift the powdered sugar into a mixing bowl. Add orange juice concentrate, orange zest, vegetable oil and water. 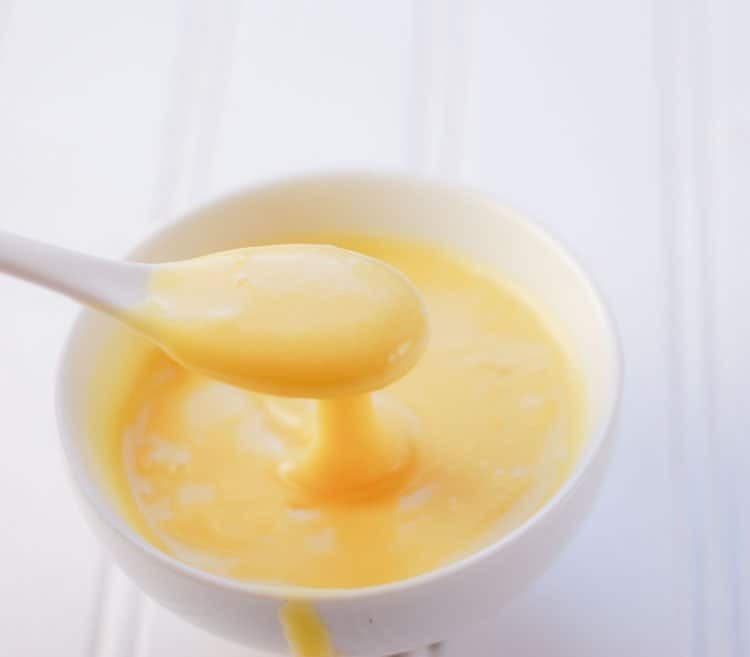 Mix well with a spoon until smooth. 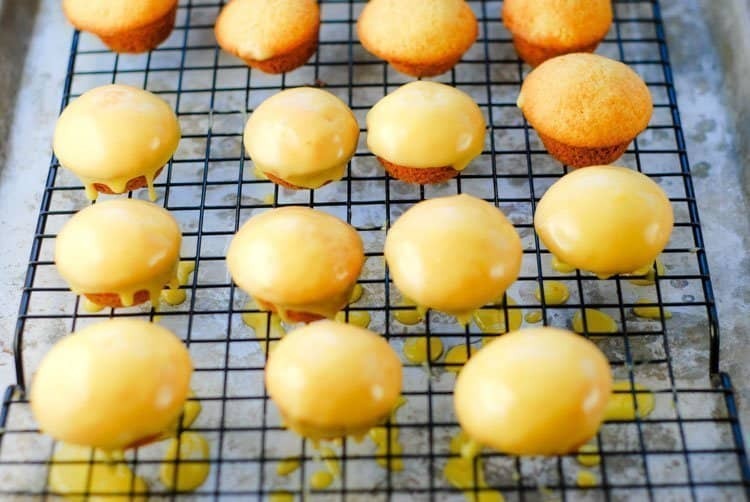 Dip each cupcake into the glaze, covering as much of the cupcake as possible. Place on wire racks. Let the glaze set for about an hour. As soon as the glaze has set, pour a tall glass of milk and enjoy one (or three) of the fruits of your labors. You deserve it. These look amazing to me. I love the dipping to cover the entire mini cupcake – and since they are mini that means I can have twice as much, right? Jaime Nicole recently posted…Grab Christmas Gift Ideas at a Best Buy Samsung Open House! These are super cute! And sound so delicious. I love your tip about the gum. haha! I desperately need to follow your gum tip! I always end up eating the batter & then never eat whatever I’m making. These look sooo good! Those look yummy! I love orange flavored desserts. The glaze looks a lot easier than messing with frosting. I am going to have to make this recipe. I can almost taste these through the screen! They are so perfectly bite-size, too! 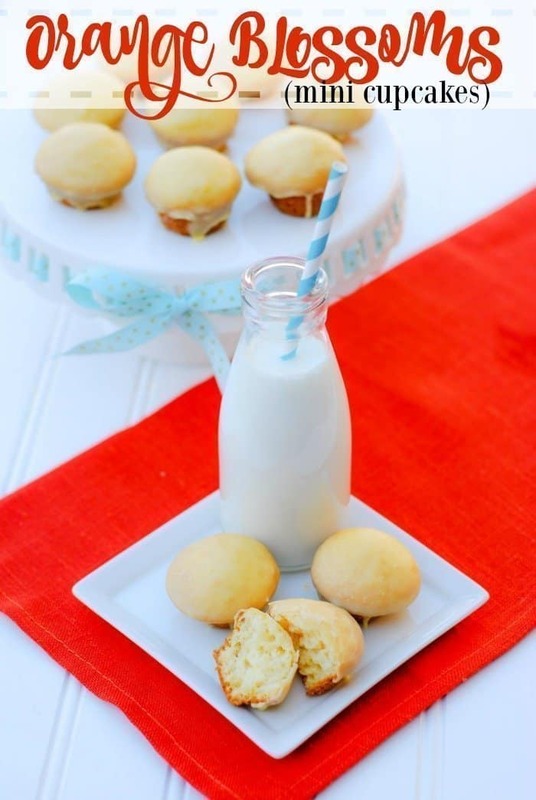 Kristen from The Road to Domestication recently posted…7 Easy Thanksgiving Dessert Ideas! Orange is one of my fave flavors in baked treats! And I love saving time by using store-bought cake mixes! I’ll be trying this recipe for sure! These look so amazing! I haven’t seen the cake mix in my stores yet, but now I’m gonna look! I like the no artificial ingredients! This looks so YUMMY! I love that orange glaze you made, I bet this made you cupcakes super sweet! OMG, I want some of these right now! I love Orange Blossom anything! Reminds me of the orange flavored cinnamon rolls! Yum, Yum! These would seriously be amazing. Lemon is my all time favorite, and these look so good. I will have to try them! Jeanine recently posted…DIY Witches Brew | The Perfect Halloween Drink! These sound delicious. I would be scared to have them in my house because I know I won’t stop at one or two! Oh, I truly could take a dive into the orange glaze! Looks so good! I like the idea of the gum thing – I should try it with my cake bowl licking kids (or maybe myself). How fun are those mini blossoms – you always have the best ideas! The cupcakes looks so tasty. It does also have a fresh orange flavor into it. That orange glaze sounds absolutely amazing right now! What a sweet idea for a treat and festive too! Christie recently posted…The Limited Edition Star Wars Playstation 4 + Game Bundle Giveaway – SECOND CHANCE TO WIN! They sure look like yummy little treats. I like that they’re small and therefore you don’t eat an entire cupcake. Saving calories is always good. Yum! I need to try these asap. While lemon is my all time favorite, I THINK i would enjoy these too! I’ve had these used with lemon, so if they are anything like that – YES PLEASE! These look sooo good!! I need to try these! I love orange anything so I bet these are so delicious! These look delicious! I love citrus flavored desserts. I can’t wait to give them try.